The third Digital Culture & Society issue on “Politics of Big Data” was published in December 2016. 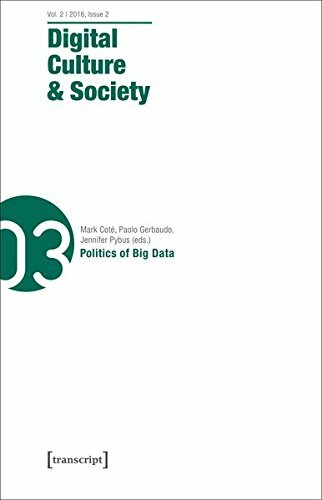 Edited by Mark Coté, Paolo Gerbaudo, and Jennifer Pybus, the issues critically examines the political and economic dimensions of Big Data and thus details its contestation. The contributions focus on the materialities and processes which manifest Big Data and explore forms of value beyond the state and capital. These range from open data initiatives, social media metrics, machine learning algorithms, data visualisation to data dashboards, critical data analysis, and new modes of data action research and practice. The print issue can be ordered through the publisher’s website (transcript). All articles are available as open access (CC-BY-NC-ND 4.0) below. All DCS issues are published under this CC license 12 months after the initial publication.